White Stallion Ranch’s horse riding program is second to none. With a large herd of over 165 very well trained horses, there is a horse for every age and riding ability. Each guest is carefully matched with a specific horse, based on their experience, height, weight, and riding ambitions. Guests normally keep the same horse for the entirety of the stay to build a bond with the steed. There is a complete range of rides that will suit any guest, from a complete novice who never sat on a horse, to an expert who is comfortable riding all day. 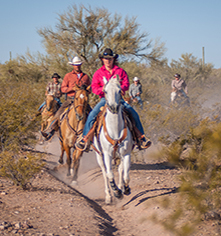 Available rides include: Scenic Rides, Fast (Cantering) Rides, Mountain Rides, Breakfast Rides, Half-Day Rides, All-Day Rides, Specialty Rides (Wine & Cheese or Beer & Cheetos), and the guest favorite Team Cattle Penning. Wranglers are available for riding lessons, six days a week, for a supplemental charge. Guided hikes are available five days a week, with a variety of trails for beginner to experienced hikers. Hike through the nearby mountains of the ranch or get transported to the adjacent Saguaro National Park to explore Native American petroglyph sites. 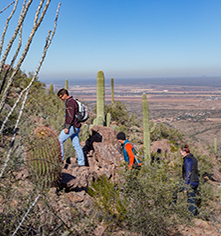 All hikes award fantastic access to and views of the Sonoran Desert. Guides are friendly and knowledgeable about the local history, geography, and biology. Mountain bikers may use the trail and road system as long as they are respectful of the riding program. Rentals can be arranged. Rock climbing is offered with a very patient, encouraging, and highly experienced rock climbing instructor. Offering climbs for beginner to experience climbers, the instructor is available up to six days a week at set times, for a supplemental charge. The True Family practices their rodeo skills once a week with the help of family friends. The rodeo is narrated and open to all guests to learn about the history of rodeo and what it takes to make a competitive cowboy. The rodeo demonstrates team rope, barrel race, steer wrestle, breakaway rope, and more. Climb on an old-fashioned hay wagon, pulled by a team of draft horses, to a delightful lunch cookout of hamburgers and hotdogs with all the fixings; offered once a week. The 24-hour fitness center has modern exercise equipment, sauna, and massage therapy rooms. Massage therapy is available 6 days a week, offering hot stone, deep tissue, and Swedish massage treatments. 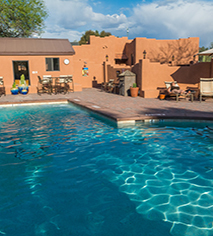 The newly renovated heated outdoor pool includes a large shaded deck space with plenty of loungers for relaxing under the Arizona sun. Use the indoor hot tub with massaging jets to soothe sore muscles. Equipment is available for use on the lighted sport courts, including basketball, volleyball, badminton, and tennis. The recreation room is stocked with interactive entertainiment, including a pool table, poker table, table tennis, air hockey, shuffleboard, foosball, and satellite television. The 27-seat movie theater features a 7-foot by 3-foot screen and plays the latest and classic movies and television shows via DVDs, Netflix, and Direct TV. The ranch petting zoo is filled with mini donkeys, mini horses, pygmy goats, deer, ducks, and chickens. Children and adults can feed and pet the very friendly animals. The fully stocked gift shop offers western souvenirs, jeans, hats, gloves, shirts, home decor, gifts, jewelry, books, and travel essentials. It is open 8:00 a.m. to 4:00 p.m. daily. Every evening after dinner, entertainment is provided to guests. Programs vary weekly, and could include a moonlit bonfire with cowboy singer and storyteller, art classes, nature program with live animals, cowboy poetry and singing, astronomy program with large telescopes and astronomer host/instructor, country and line dancing, or archaeology talks.